Updated Tuesday February 25, 2014 by Poco Mens Baseball. The following General Principles Should be followed when deciding whether to eject a player, Coach, Manager or other person from a game or park. Use of Profanity of any kind, directed at an umpire or vulgar personal insults of an umpire are grounds for immediate eject. Physical Contact with an umpire is grounds for ejection and fines. Physical contact or fights within the boundaries of the ball park are grounds for automatic ejection and league fines. Refusal to stop arguing, and further delaying the game after the umpire has provided a player or manager adequate opportunity to make a point, is grounds for ejection. The umpire should warn the player or manager that he has been heard and then return to his position on the field or be ejected. If a player, coach, manager argues balls or strikes(including a half Swing) he can be warned and then ejected if he does not stop. Use of histrionic gestures( i.e., jumping up and down, Violently waving arms or demonstrations) while arguing with an umpire or leaving the dugout and making gestures toward an umpire are grounds for ejection. Throwing anything from the dugout is ground for automatic ejection. Throwing equipment in disgust over an umpires call is grounds for ejection. The umpire may give a warning but throwing any equipment causes a league fine to be issued. 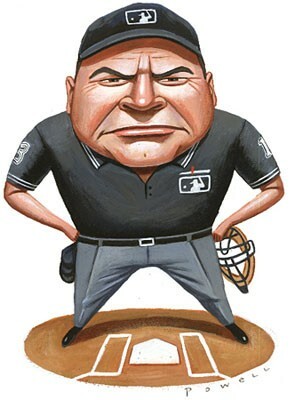 Any player, manager, or Coach, that fails to comply with an order from an umpire to do or refrain from doing anything that is within the Official Baseball rules, is grounds for ejection. Arguing judgments calls ( i.e. safe, out; fair, foul; Balks) are grounds for ejection. In addition, there are situations listed in the Official Rules of Baseball that results in immediate ejection. These include violations of a pitcher in possession of a foreign substance, Batter charging a pitcher, a pitcher intentionally throwing at a batter. Any situation not covered under the Official rules of baseball is covered by Rule 9.01(c ) and ruled by the Umpire crew chief.